Awareness is power; let’s talk about the elephant in the room - child abuse. Awareness is power; let’s talk about the elephant in the room - child abuse.The cases of child molestation across the country are rising day by day and one thing is very clear that being a parent, if you want don’t want your child to be the victim, then you have to teach your child few basic things. The core reason behind child molestation is lack of awareness among children. One of the most important things you should take care is that you should teach your child the difference between good touch and bad touch. Let’s face the hard truth that children are not safe anymore and it’s high time you have to teach your child important things at a very tender age. Today we will discuss how you can tell your child, the difference between good touch and bad touch. 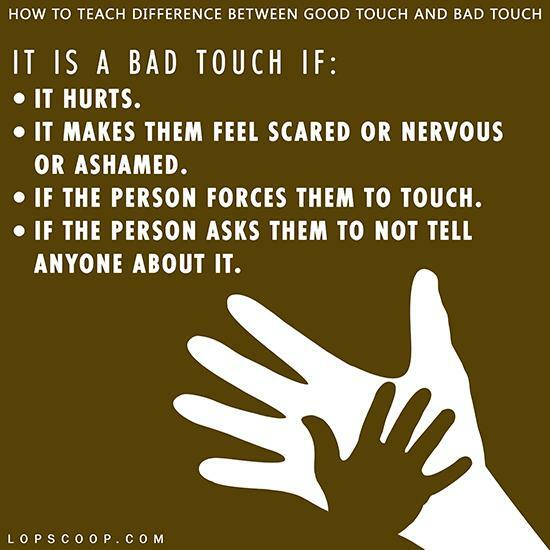 Here is the list of ways to educate your child About Diifference Between Good-Touch And Bad-Touch. Build trust with your child, so that they can share everything with you and tell them you are there for them whatever happens. Follow this rule as it is the easiest way to teach your child about the good touch and bad touch. Let them know that every touch is not a bad touch. Teach them that at times father, mother or doctor touch them to show love and care and if a doctor touch, it is because they want to check or examine. Make sure you teach the above points to your child. Share this article with your friends and family as much as you can to create awareness.